France Mourns as Fire Rips Through Historic Notre-Dame Cathedral That Has Stood for Centuries | Democracy Now! associate professor of medieval history at Johns Hopkins University. France is reeling after a massive fire tore through Paris’s beloved Notre-Dame cathedral, built 800 years ago and a celebrated landmark around the world. Parisians looked on in shock Monday as around 400 firefighters attempted to get the blaze under control—some onlookers engaging in prayers and religious songs. The fire claimed the cathedral’s spire and ravaged parts of the interior, but the iconic twin medieval towers remain standing, as does the rest of the stone structure. Two of France’s wealthiest men have pledged over $330 million to the reconstruction effort. The European Union has also vowed to help rebuild the church. Authorities have launched an investigation into how the fire started, but ruled out arson, saying they believed it was started by accident, likely related to the ongoing $180 million renovation of the building. We speak with Anne Lester, associate professor of medieval history at Johns Hopkins University, about the role of Notre-Dame in French cultural and spiritual life, as well as its significance to the wider world. JUAN GONZÁLEZ: France is in mourning today after a fire ripped through Paris’s beloved Notre-Dame cathedral, a medieval church in the heart of the city that was built more than 850 years ago. Thousands of Parisians watched in shock on Monday as the fire toppled the cathedral’s spire and continued to burn for hours. For centuries, Notre-Dame has been the center of Catholic life in France, and it is one of the most visited churches in the world. The fire occurred during the holiest week of the Christian year. Authorities are just beginning to assess how much was damaged inside the church. On Monday night, French President Emmanuel Macron spoke to reporters nearby. PRESIDENT EMMANUEL MACRON: [translated] The worst has been avoided, even though the battle has not yet been completely won. The next few hours will be difficult. But thanks to the courage of the firefighters, the facade and main towers have not collapsed. So, tonight, above all, my thoughts go out to the Catholics, Catholics in France and all over the world, especially during this Holy Week. I know how they feel, and we are with them. … My thoughts also go out to all the people of Paris. Notre-Dame of Paris is their cathedral and more. The mayor of Paris was with us all these hours, from the first flames, and I know how she and all the residents of the city are feeling. I also want to spare a thought for all our compatriots, because the Notre-Dame of Paris is our history, our literature, our imagination, a place where we have lived all our great moments, our epidemics, our wars, our liberation. It is the epicenter of our lives. It is the benchmark from which distances start and from which we measure ourselves from Paris. It appears in so many books, so many paintings. It is a cathedral that is the one of all French men and women, even those who have never come here. JUAN GONZÁLEZ: Mourners gathered throughout the night in Paris to pray and sing while watching the flames engulf the cathedral, a structure which can be seen throughout the city. MOURNERS: [singing] Je vous salue, Marie, pleine de grâce. AMY GOODMAN: While the fire destroyed the cathedral’s spire, Notre-Dame’s iconic twin medieval towers remain standing, as does the rest of the stone structure. French authorities have launched investigations into how the fire started and the structural stability of the building. The cathedral was undergoing a major restoration when the blaze began. Last year, the Catholic Church launched a major fundraising appeal to help preserve the cathedral. At the time, the church said, “Parts of the 850-year-old Gothic masterpiece are starting to crumble, because of pollution eating the stone, and there are fears the structure could become unstable,” they said. French President Macron has vowed to rebuild Notre-Dame. Two of France’s wealthiest men have already pledged over $330 million. This comes as Macron’s government continues to push sweeping austerity measures. Guardian columnist Aditya Chakrabortty tweeted, “The Notre Dame exposes the paradoxes of austerity politics: Macron preaches cut for French people, yet swears a national effort to restore a cathedral Billionaires squeal at paying higher taxes, yet can throw millions at this We haven’t moved far from the rich buying indulgences,” he said. The European Union has also vowed to help rebuild Notre-Dame. Donald Tusk, the president of the European Council, spoke earlier today in Brussels. DONALD TUSK: The burning of the Notre-Dame cathedral has again made us aware that we are bound by something more important and more profound than treaties. Today we understand better the essence of that, which is common, we know how much we can lose. And that we want to defend it—together. AMY GOODMAN: To talk more about the fire at the Notre-Dame cathedral and the church’s historical significance, we’re joined now by Anne Lester, associate professor of medieval history at Johns Hopkins University. Professor Lester, welcome to Democracy Now! Describe your feelings as you watched the flame yesterday, the flames engulfing the spire of Notre-Dame, the ceiling collapsing, what they call the forest, because it almost took a forest of trees to build that ceiling. The significance of Notre-Dame cathedral? ANNE LESTER: Yeah. I mean, I think, like everyone across the world watching this, it was shocking and devastating, really. I’ve spent my career working on Paris, on the medieval period, on Notre-Dame, and all the things that have been collected in the building there, and the life and cultural heritage of this building and what it embodies. I think we were all just shocked watching the spire burn and collapse into the center of the cathedral. And certainly, it made, I think, everyone think about the way that a monument like this functions in our modern world today. It really is a testament to a set of ideas, human ideas—in this case, about the divine. And as is true of all monuments, it has been here for hundreds of years before us, and we all assumed it would persist for hundreds of years to come. So, I think it was a very—it has been a very overwhelming, you know, nearly day and a half—a day, 24 hours, really. JUAN GONZÁLEZ: Well, Professor Lester, as someone who knows well all of the historical—the artifacts and the relics that are in the cathedral, what have you heard so far, what have you been able to glean, in terms of what was preserved and what may have been lost? ANNE LESTER: Yeah. What we’ve learned from friends and colleagues in Paris is that it seems, very early on, there were efforts by the administrators of the cathedral, and of course in coordination with the firefighters, to save what they could, that people were going in and grabbing what they could and leaving the building as quickly as possible. Distinct efforts were made to preserve two of the most important, most holy relics that were contained in the building, that would have been the center of veneration during Holy Week, first and foremost, of course, the crown of thorns, which is a reliquary dating back to the time of Jesus’s passion. The relic of the crown, it was believed that that was put on his head at the time of the passion to mark him and to mock him as the king of the Jews during the crucifixion. It was preserved, then moved over time to Constantinople and then, eventually, brought in the middle of the 13th century to Paris, where it resided, ever since 1237. So, the history of that relic, the history for the Catholic faith, for the culture of France and of Christianity, is profound. And it’s my understanding that that was saved, as well as a relic of the tunic of Saint Louis, the king of France in the 13th century, who dies in 1270—a very holy symbol of the kingdom of France and the French realm—and that those two and possibly other relics and portable objects from the trésor, or the treasury, were saved. JUAN GONZÁLEZ: What was likely lost, from what you have been able to tell so far? ANNE LESTER: Yeah, it’s very hard to know. I haven’t—I mean, another relic of great significance was the relic of the True Cross, that was also kept there. I have yet to hear whether that was preserved. Certainly, what’s very clear, even though the stonework of the building itself, as well as the vaulting on the interior, for the most part, seems to have been preserved, no doubt deeply scarred, there is going to be both damage from the fire, as well as from the water putting the fire out. Water is not good for limestone. Much like marble, it will melt if it is saturated with water and not able to dry quickly enough. So, there are parts of the building that were preserved, but then we know much of the wood on the interior, carved wood, part of the choir that would have been carved in wood, that area where the canons would sit and sing the Mass—it’s unclear whether the carved statuary that encircled the high altar and that choir area, a relief sculpture carved beautifully in the later Middle Ages, painted in fine detail—something that leapt out to any visitor who walked around that part of the cathedral, because it really told, in an animated cycle of sculpture, the story of the life of Jesus, and it was an extremely compelling way to communicate these stories to people, people from the Middle Ages onward who didn’t read, who couldn’t read or who were listening and knew the stories orally—that seems not to survive. And perhaps most devastating of all is the loss of the glass in the cathedral, because, of course, when a fire burns that hot, the lead that held the stained glass panels in place, particularly in that choir area and in the crossing, where the spire fell in the middle of the cathedral, that lead would melt, and the glass would either melt itself, because it got so hot, or certainly would be lost. Thankfully, the three—it seems that the three great rose windows on the west, north and south facades have remained in place. AMY GOODMAN: Anne, if you can talk about, I mean, the history that the cathedral has lived through, if you will, I mean, from the French revolution, epidemics, the two World Wars? ANNE LESTER: Yeah, absolutely. I mean, the cathedral, as we see it today, was begun in 1163, if we can imagine that, right?—you know, over 800 years ago—and persisted, was built over the course of more than a hundred years, through the 13th century. It changed in styles to express new ideas, new notions of devotion and what the divine was. It changed to accommodate more and more visitors who came to Paris as the city itself grew. And, exactly, like a monument that is witness to so much that happens around it, Notre-Dame was there for people during the period of the plague in the 14th century that devastated cities like Paris. It was there during the period of the Hundred Years’ War, a backdrop to the story that played out for someone like Joan of Arc, another hero in French history. Likewise, the cathedral persisted through periods of religious war, which marred France. It was there as a symbol and was damaged, in turn, on the part of the Huguenots active in Paris. It, of course, persisted through the revolution, as well, and was a symbol to people in the revolution, particularly the carving of the kings, representations of the Old Testament kings that were also viewed as representations of the kings of France. They were damaged, the heads lopped off. But the people of Paris lovingly saved that sculpture, and some of it was able to be restored over time. Notre-Dame also persisted through the two World Wars, which is remarkable, as other grand cathedrals in France did not—Chartres, for example, Soissons, Amiens, cathedrals that were damaged, particularly during either the First or Second World War in bombing campaigns. That was not the fate for Notre-Dame. The people of Notre-Dame actually took down the glass, preserved it, did what they could to preserve the stonework of the cathedral. In this case, with this fire, something so unexpected, that moved at such a fast pace, there was no way there was time to consider how or what could be preserved. So the building itself really has witnessed scores of French history, witnessed the very making and remaking of a notion of France and of the French monarchy. It was a crucial building for Napoleon and his image and vision of what France could become in the 19th century, as well as the way that France restored itself after the Second World War. It became a symbol for people, of unity and of what it means to rebuild and remake French civilization. JUAN GONZÁLEZ: And, Professor Lester, how do you—your reaction to the overwhelming public reaction, people coming forward now to donate, some of the richest people in France now promising hundreds of millions of dollars to restore the cathedral, especially coming as it did, this tragedy, right in between Palm Sunday and Good Friday and Easter, the holiest week in the Christian calendar? ANNE LESTER: Yeah. I mean, I think the building clearly has resonance far beyond the borders of France. You know, it is a world monument. It is marked out that way. Tourists come from across the globe to visit Notre-Dame. And to have walked through the building, to have taken in the kind of vision of what the experience of the divine should be like, whether you’re Christian or not, have entered into that building, you would experience some of that. And I think the sentiment that we see coming out across the world, and certainly from Americans who have spent a great deal of time there, from people in Britain, from all over, who visited, this is a monument that has great cultural significance to all of us, in many ways, representing a whole host of ideas. And to be sure, to Catholics, during Holy Week, the loss of this building is just almost unbelievable, hard to really fathom. I think it’s extremely difficult for us to conceive of the significance, as I say, of the relics that were kept within the treasury. The crown of thorns would have been processed during Holy Week. It would have been the focal point of devotion, as it had been for many years at Notre-Dame. And we’re very lucky that the relic itself was saved, but it is hard to imagine the relic having the same meaning, not being able to move through the space of the cathedral itself. I think it’s not surprising that people are interested in donating to the restoration of Notre-Dame. I think that’s crucial. It is clearly a way to bring people together within France. France, like many countries across the globe, are just going to experience a set of really difficult decisions. Moves for general austerity come up against and really point out, again, the sort of paradox of the meaning of a cultural symbol like this, which will demand attention right away. And I hope that there can be ways to navigate this situation, to have people of means donate as they can, and to really take this as a moment where we can evaluate what it means for all of us to come together as a community and the ways in which cultural symbols, symbols produced for cultural unity, really can function in that way. I think the rebuilding campaign will be tremendously important. AMY GOODMAN: Anne Lester, we want to thank you for being with us, associate professor of medieval history at Johns Hopkins University. The relics they saved, I understand, will then be on display now at the Louvre while they rebuild the Notre-Dame cathedral. This is Democracy Now! When we come back, Omar Barghouti joins us. The Trump administration did not allow him into the United States, but we break the sound barrier with his voice. Stay with us. 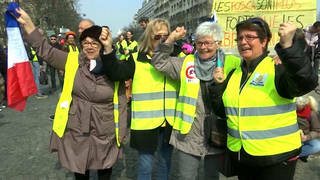 AMY GOODMAN: People singing “Hail Mary” across the bridge facing the Notre-Dame cathedral last night as the spire burned.